The Cfp to PyData Florence 2018 is Open!. The deadline for submissions is January, 14th at 23:59. The registration to PyData Florence 2018 will be managed directly by the PyCon Nove team. Purchasing a ticket to PyData Florence 2018, you will be granted for the whole PyCon Nove conference, and related events. The price of the ticket include Lunch & Coffee Breaks, Free Wi-Fi, access to the recruiting session, T-shirts, gadgets and prizes. 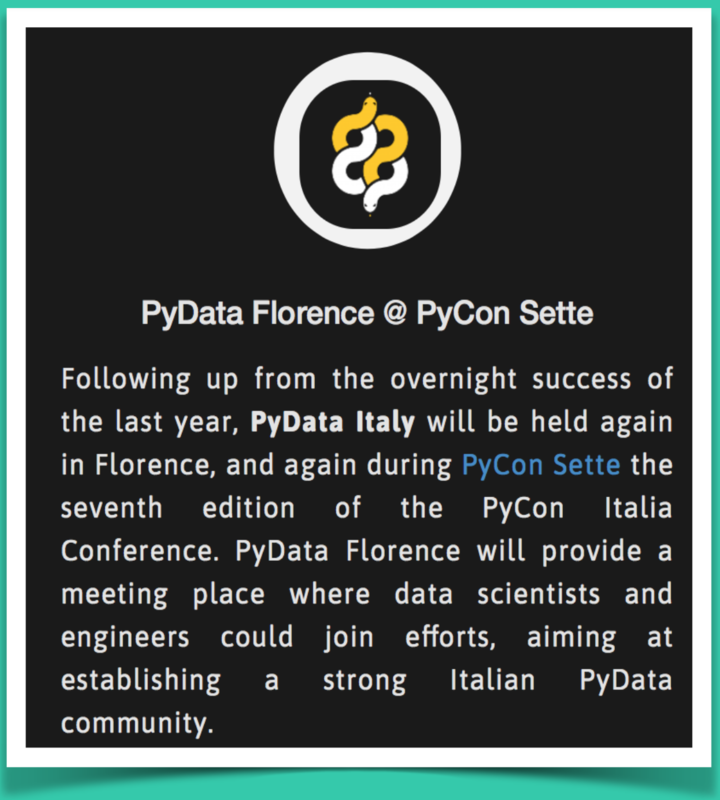 PyData Florence 2018 is going to be a three-days event (April, 20-22 2018), held in conjunction with PyCon Nove the ninth edition of the Italian Python Conference. The conference venue will be the Grand Hotel Mediterraneo located nearby the old city centre of Florence, (Lungarno del Tempio, 44 - not far from the beautiful Piazza Santa Croce). PyData website is a gathering of users and developers of data analysis tools in Python. 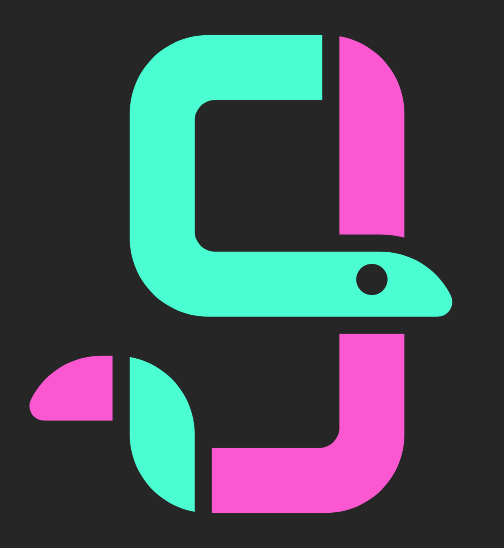 A major goal of the conference is to provide a venue for users across all the various domains of data analysis to share their experiences and their techniques, as well as highlight the most triumphs and potential pitfalls of using Python for certain kinds of problems. 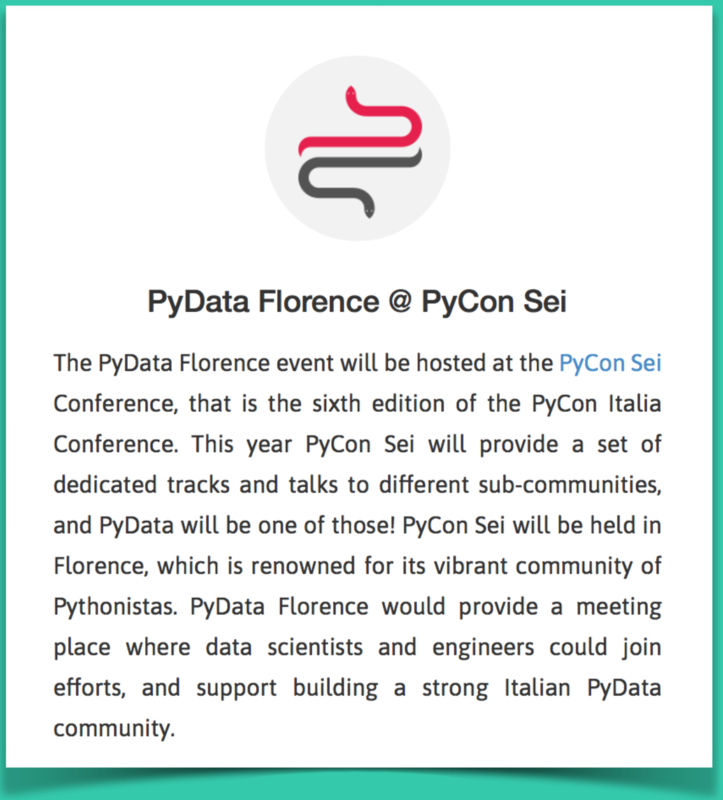 Following up from the success of the last years, PyData Italy will be held again in Florence, and again during PyCon Nove the ninth edition of the PyCon Italia Conference. PyData Florence will provide a meeting place where data scientists and engineers could join efforts, aiming at establishing a strong Italian PyData community. Design Rights © 2014, 2015, 2016, 2017, 2018 Fabrizio Maggio.